Correcting a construction error. The builder didn’t insulate the garage ceiling, but LeafGuard by Midlands Home Solutions can do the job quickly and affordably by installing dense-pack cellulose. Exterior siding is replaced after the blown-in installation. If your house has a detached garage, then there is truly no worry about garage insulation and it's effect on the comfort and energy efficiency of the house. However, an attached garage that is poorly insulated can absolutely affect your home's comfort -- especially if you have a finished room over the garage. If you want to improve your garage insulation, call the local experts at LeafGuard by Midlands Home Solutions today. We provide complete insulation solutions for homeowners in Omaha, Lincoln, Council Bluffs and the surrounding areas. When a house is built, the common wall and ceiling between the garage and the home's living space should be air-sealed and insulated. However, builders sometimes skip this step. LeafGuard by Midlands Home Solutions can inspect your garage and correct garage insulation problems. Since most houses have attached garages and therefore a structural connection between these spaces, there's also a thermal connection. If you have an attached garage, there's a good chance that insufficient garage insulation is compromising your comfort and costing you money, especially if you have a room over your garage. It's essential to insulate the garage ceiling if there is living space above the garage. Without garage ceiling insulation, the living space above the garage will be uncomfortably cold in winter and hot in summer. You'll be wasting energy nearly all year round. When the garage is attached to the house, the wall that separates the garage from the living space should be air sealed, insulated and finished with fire-rated drywall. SilverGlo™ rigid foam insulation installed by the experts at LeafGuard by Midlands Home Solutions, can provide insulating and air sealing value superior to other types of garage insulation. SilverGlo™ offers high R-value, durability (it won’t compress like fiberglass) and immunity to mold and moisture damage. Plus it has an integral radiant barrier for additional energy savings. There are two types of doors in garages: those for people and those for cars. A people-type garage door should be insulated and weatherstripped for energy efficiency, and rated for fire protection specified in local building codes. LeafGuard by Midlands Home Solutions are the local insulation experts you need for all your garage insulation problems. 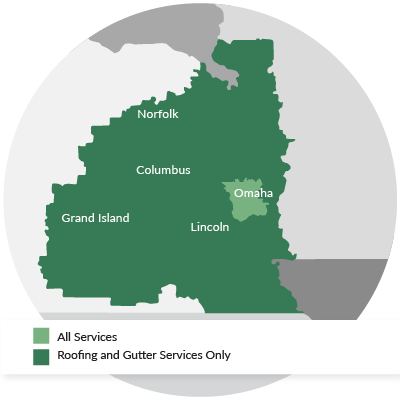 Call us today at 1-844-807-6136 or fill out the online form to schedule a free estimate for garage insulation in Omaha, Lincoln, Council Bluffs, Sioux City, Bellevue, Grand Island, Kearney, Fremont, Hastings, La Vista and throughout the surrounding areas.